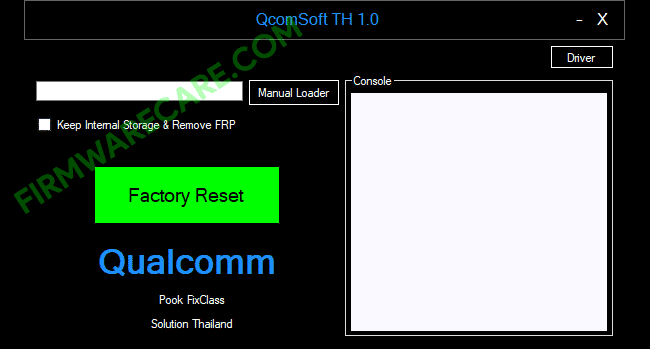 Qcomsoft v1.0 is a small application for windows computer created by Songsak Songsermlorsagul, which allows you to reset your smartphone and tablets. You can factory reset your android device using Qcomsoft quickly with its simple and easy to use interface. It allows you to factory reset your Android smartphone and tablets running on qualcomm chipset only. Qcomsoft v1.0 allows you to reset your android device without losing your internal storage data. It means, you will be able to access your storage data even after your device undergoes a factory reset. It also offers option to download drivers for your qualcomm devices. Since, it is an open source tool, you may use it free for always. In order to use the Qcomsoft Tool, you need to install the Universal ADB Driver on your computer. [*] Compatibility: The Qcomsoft Application runs perfectly on Windows XP, Windows Vista, Windows 7, Windows 8, Windows 8.1 and Windows 10 (32 bit and 64 bit). [*] Credits: Qcomsoft Tool is created and distributed by Songsak Songsermlorsagul (developer). So, full credits goes to Songsak Songsermlorsagul (developer) for sharing the tool for free.